Wanna go to a reception in Baltimore this week? Saturday, July 25, 2009 between 6-9pm for the closing reception of the School 33 Studio Artists’ Exhibition. Please include a SASE for notification and return of materials. 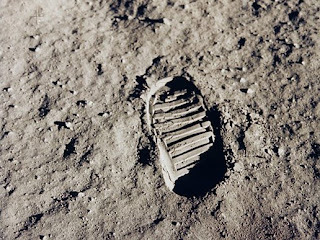 40 years ago today, the most amazing feat in human history occurred when an American civilian of Scottish ancestry set foot on the moon and became the first human to leave his footprint somewhere else than Earth (at least that we know about). This was not only a magnificent scientific achievement, but also a spectacular source of artistic images and we first viewed our world (in a photograph) from another celestial body. The images and objects that those brave men brought from the moon are not just scientific paraphernalia, but some of our nation's greatest works of art. I hereby call for the Obama administration to renew the historical Kennedy call for the exploration of space. It can once again become the greatest scientific, explorational and artistic achievement of this planet.